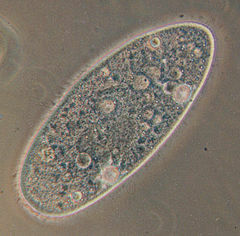 Paramecium aurelia, a ciliated protozoa. Protozoa (in Greek proto = first and zoa = animals) is a diverse group of single-celled, microscopic or near-microscopic eukaryotes (organisms whose cells have nuclei) that commonly show characteristics usually associated with animals, most notably mobility and heterotrophy. An organism belonging to this group may be known as a protozoan (plural protozoans) or protozoon (plural protozoa). Both protozoa and protozoans are popular as the plural form. Among well-known protozoans are amoebas, ciliates, paramecia, and dinoflagellates. Protozoa may live freely or as parasites, and may live as single cells or in simple colonies without any differentiation into tissues. While most are microscopic, some grow large enough to be seen unaided. While some are known for causing disease (malaria is caused by parasitic forms), protozoans are vitally important ecologically as key links in food chains. Ubiquitous in aquatic environments and the soil, protozoans prey upon algae, bacteria, and other organisms and are themselves consumed by animals such as microinvertebrates. Protozoa span several phyla that are generally placed not as part of the kingdom Animalia, but rather as part of the kingdom Protista, sometimes known as the "other" kingdom or the "left-overs" kingdom. The kingdom Protista (or Protoctista) claims all the eukaryotic organisms that are not animals, plants, or fungi. In some schemes, Protozoa is considered a sub-kingdom of Protista. Often, protozoa is just an informal term for unicellular, heterotrophic protists. The name protozoa ("first animals") is misleading, since they are not animals (with the possible exception of the Myxozoa). Most protozoans are too small to be seen with the naked eye—most are around 0.01–0.05 mm—but can easily be found under a microscope. However, forms that are up to 0.5 mm are still fairly common. Towle (1989) reports that over 56,000 species of protozoa have been identified, the great majority (over 60 percent) of which move by pseudopodia, false feet or temporary projections of the cell. Free-living protozoa are ubiquitous throughout aqueous environments and the soil, and play an important role in their ecology. Many aquatic forms make up the zooplankton. Protozoa occupy a range of trophic levels. As predators upon unicellular or filamentous algae, bacteria, and microfungi, protozoa play a role both as herbivores and as consumers in the decomposer link of the food chain. Protozoa also play a vital role in controlling bacteria populations and biomass. As components of the micro- and meiofauna, protozoa are an important food source for microinvertebrates. Thus, the ecological role of protozoa in the transfer of bacterial and algal production to successive trophic levels is important. Some protozoa are important as parasites and symbionts of multicellular animals. Among these, several are powerful agents of human disease: members of the genera Plasmodium cause of malaria; Trypanosoma cause of African trypanosomiasis, or sleeping sickness, and Chagas disease, or South American trypanosomiasis), Leishmania (cause of leishmania, which affects millions of people in Africa, Asia, and Latin America; and Giardia causes giardiasis. Plasmodium utilizes Anopheles mosquitoes for transmission; some Trypanosoma species utilize the tsetse fly or conenose bugs; Leishmania is carried by sand flies; and Giardia is carried by muskrats and beavers (Towle 1989). Most protozoa, whether free-living or parasitic, lack a protective outer covering (Towle 1989). Thus, a semipermeable cell membrane serves as the boundary between the environment and the cytoplasm, and minerals (calcium, potassium) and gases (oxygen, carbon dioxide) exchange across this membrane (Towle 1989). Protozoa have at least one motile stage. Under certain adverse conditions, some protozoa produce a protective capsule called a cyst, which permits the organism to survive when food, moisture, or oxygen is lacking, when temperatures are not suitable, or when toxic chemicals are present. A cyst also enables a parasitic species to survive outside its host in order to get a new host. This is important because parasitic protozoa sometimes have to go through the excretory system of one host in order to find a new host. Members of the phylum Apicomplexa form a cyst called an oocyst, a reproductive structure in which new cells are produced sexually. Many free-living protozoans have eye-spots that can detect changes in the quantity and quality of light, and some sense touch and chemical changes in their environment (Towle 1989). The phyla into which protozoa fall vary with the taxonomic scheme. Based on the above divisions, four phyla that are commonly recognized are Sarcodina (those moving by cytoplasmic projection, or pseudopodia; the amoebas); Ciliophora (those moving by cilia); Zoomastigina or Mastigophora (those characterized by one or more flagella); and Sporozoa (immobile and parasitic protozoans). Some other names used in different schemes for phyla include Sacromastigophora, Apicomplexa, Microspora, Myxozoa (spore-producing forms), and Opalinida. There is a large variety of classifications. Towle (1989) recognizes four phyla following the classification above: Sarcodina, Ciliophora, Zoomastigina, and Sporozoa; in other words, those that move by pseudopodia, cilia, flagella, and are immobile and parasitic. Another scheme recognizes three phyla, Ciliophora (movement by cilia in at least one stage), Sarcomastigophora (locomotion by flagellum or pseudopodia or both), and Apicomplexa (cilia and flagella absent, parasitic, and cysts present), and place Mastiogophora (flagellates) and Sacrodina (move by pseudopodia) as subphyla of Sarcomastigophora (UM-CBS 2007). Overall, Towle (1989) reports that 40,000 species have been identified as those moving by pseudopodia, 8,000 moving by cilia, 2,500 species of those protozoans with one or more flagella, and 6,000 species in phylum Sporozoa with no means of locomotion. Hickman, C. P., and L. S. Roberts. 1994. Biology of Animals, Sixth Edition. Dubuque, IA: Wm.C.Brown Publishers. University of Minnesota, The College of Biological Sciences (UM-CBS). 2007. Sub-kingdom: Protozoa Retrieved October 24, 2007. This page was last modified on 29 August 2008, at 15:18.